Makinti Napanangka is the most senior woman painting with the renowned Papunya Tula Artists. As with other Pintupi women now exerting their considerable influence on Australian art, Napanangka worked on the collaborative Haasts Bluff/ Kintore women's painting project. 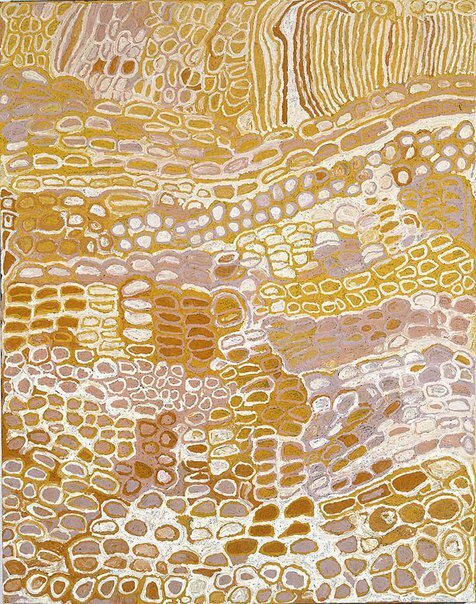 This series of major paintings, completed in 1994 and exhibited at the Tandanya National Aboriginal Cultural Institute in Adelaide, marked the beginning of Pintupi women's participation in the Western Desert art movement as independent artists. Up until then, women had largely worked as collaborators on paintings by their husbands and other close mate relatives. Napanangka joined Papunya Tula Artists in 1996. Most senior practitioners of Western Desert art led a traditional bush life in their desert homelands until their first contact with white Australians as young adults. Napanangka's life has followed the same course and, as with most Pintupi people, she has returned to live close to her country at Walungurru (Kintore), a small Aboriginal community established during the outstation movement, more than 500 kilometres west of Mparntwe (Alice Springs). Napanangka is a familiar presence at the Papunya Tula arts centre in Walungurru, often the first to arrive with her pack of camp-dogs to begin a day of intense painting. Even when her eyesight faltered, Napanangka's enthusiasm for painting on canvas remained undiminished. When she recovered, her work showed renewed vigour, and was exhibited in the major retrospective 'Papunya Tula: Genesis and Genius' at the Art Gallery of New South Wales, Sydney, in 2000. 'Untitled', 2000, contains all the hallmarks of Napanangka's style, owing more to the gesture of handpainting ochre onto the body for women's ceremonies, than to the meticulous application of dots that characterises men's ceremonial and contemporary art making. Napanangka's paintings often depict designs associated with the travels of the Kungka Kutjarra (Two Ancestral Women). The lines entering the upper section of 'Untitled', 2000, represent the handspun, hair-string skirts worn by women during ceremonies. The celebratory nature of these performances is expressed in the hedonistic play of colour and form across the painting's surface. Napanangka's art personifies the ongoing presence of Pintupi cultural traditions in the contemporary painting movement. Hetti Perkins, Tradition today: Indigenous art in Australia , 'Makinti Napanangka', pg. 104, Sydney, 2004, 104, 105 (colour illus.). Papunya Tula: genesis and genius , Sydney, 2000, 140 (colour illus. ), 282.